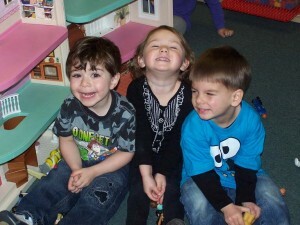 Our preschool is based on the developmental needs of children. Classes allow time for group and individual play in our classrooms, in our indoor area and on our state of the art playground. Daily activities include facilitated play, creative art experiences, music, dramatic play, story time, science and exploration, gross and small motor activities and outdoor play. There is a healthy balance of structured and unstructured activities during each preschool session. Through play and problem solving, children learn the basic skills necessary to achieve—academically, creatively, socially, physically and emotionally. The curriculum varies with the cycle of the calendar and with the children’s interests, and also meets the benchmarks in all subject areas of the Illinois Early Learning and Development Standards.